"Stories of Heroism and Self-Sacrifice "
MEDAL OF HONOR, a new documentary series on Netflix, tells the stories of some of America’s bravest men, its Medal of Honor recipients. Documentary interviews combine successfully with well-made dramatic reenactments. Some language and violence concerns make the show unsuitable for younger children. The beginning of each episode of Netflix’s new show MEDAL OF HONOR reminds audiences that, of the 40 million Americans who have served in the U.S. Armed Forces, less than 4,000 have been awarded the Medal of Honor. This is the highest honor of the U.S. military, given for acts of valor in action against an enemy force. The men (and one woman) who have earned this distinction are a special class of people, who are willing to put their lives on the line for others. Each of their stories are incredible and amazing. These stories are the subject of Netflix’s new project. Each episode tells the story of a Medal of Honor recipient, both the longer story of their lives and the more compact story of the act of valor which earned them their medal. One of the real strengths of the show is its diversity. Each episode is different, with a different story, a different person, a different war. Among the episodes are stories from WWII, the Korean War, the Vietnam War, and the War in Afghanistan. This diversity prevents the show from falling into a rut or growing stale. The episodes are a combination of documentary and dramatic reenactment. Interviews with military experts, veterans, commanding officers, history professors, other Medal of Honor recipients, and family of the soldiers occupy a major part of each episode. These testimonies help to contextualize the time period, the military maneuvers and the life story of the soldiers. Then, incredibly well-produced dramatizations of the act of valor for which the medal is awarded fill out the rest of each episode. These dramatizations are enthralling. They really could be an episode, or even a movie, all on their own. Strong performances by the ensemble and concise, engaging scripts the episodes avoid becoming cheesy or difficult to watch. The program isn’t explicitly Christian, though many of the soldiers and families are people of faith. It does, however, contain a strong moral worldview. As you might expect, patriotism is highly celebrated. Bravery and self-sacrifice are also held up as incredibly important character traits. Only the best are willing to give so much of themselves as to be awarded the Medal of Honor. The show highlights the best parts of these men, showing their courage in the face of often overwhelming odds. In each episode, viewers learn about someone who was willing to give everything in service of their brothers in arms, and their country. There is some harsh language, though the amount varies episode to episode. The dramatic reenactments are fairly violent, containing realistic battle scenes including soldiers killed by gunfire, explosions, bayonets, and other weapons of war. Most MEDAL OF HONOR episodes warrant caution for older children. Two episodes warrant extreme caution for some multiple “f” words. 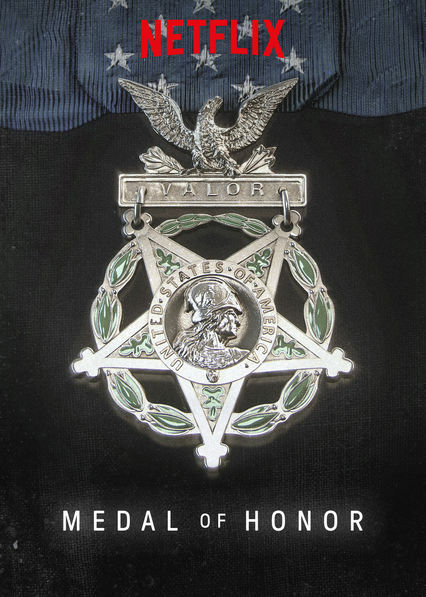 MEDAL OF HONOR, a new documentary series on Netflix, is part documentary and part reenactment. Each episode tells the story of a recipient of the American Medal of Honor, the nation’s highest military honor. Interviews with experts and family of the soldiers juxtapose with well-produced dramatizations to create an engaging and high-quality series. The diversity among stories makes every episode feel like something different than the last. Stories are pulled from World War II, the Korean War, the Vietnam War, and the War in Afghanistan. The combination of documentary interviews and dramatizations is incredibly effective. Strong performances by the actors and concise, engaging writing work together to help the dramatizations avoid becoming cheesy. There is a strong moral worldview where self-sacrifice and bravery in the face of danger are highlighted as important character traits. Each soldier’s sacrifice is inspiring. Some episodes contain harsh language. All episodes contain realistic scenes of war violence, including many soldiers being killed by gunfire, bayonets, grenades, etc. The show does its best to avoid serious gore, but some blood is seen in nearly every episode.